The political leader of the Palestinian militant group Hamas has said the group will increase attacks on Israel if it attacks Iran. Khaled Meshaal told reporters in Tehran that his group would join a united front against the enemies of Islam. 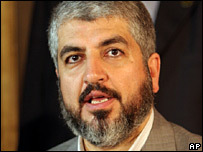 Mr Meshaal also praised Iranian President Mahmoud Ahmadinejad for his "courageous" remarks about Israel. The president has been strongly criticised for saying on Wednesday that the Nazi Holocaust was "a myth". Mr Ahmadinejad also called for Europe or North America to host a Jewish state, not the Middle East. The Hamas chief was visiting Tehran for talks with Iran's leadership. "What Iranian officials say may not please some people, but these are just courageous declarations," he said. "The Islamic world should not pay the price for the Jews' problems. It is unfair." Mr Meshaal also took the opportunity to express solidarity with one of his group's main supporters. "Just as Islamic Iran defends the rights of the Palestinians, we defend the rights of Islamic Iran. We are part of a united front against the enemies of Islam," he said. "If Israel attacks Iran then Hamas will widen and increase its confrontation of Israelis." Mr Meshaal also queried international concern over Iran's nuclear ambitions, which Tehran says are peaceful. "Even if Iran's programme is military, what is the problem? Why do other countries like Israel have the right to have a nuclear weapon?" he asked. On Tuesday, Mr Meshaal met Iranian Supreme Leader Ayatollah Ali Khamenei, who urged him to continue Hamas' resistance against Israel and not to enter into negotiations.